Why Are the Markets Rallying? The latest stock market rally has started to get on my nerves. It’s not that making money in the market is a bad thing. To the contrary, I am personally all for it. However, something about it has seemed out of place. The business cycle and stock market are pretty tightly correlated. When business increases, stock prices go up and visa versa. The problem is the economy is slowing and housing is clearly in a big correction. In short, this doesn’t seem to be the time when the markets should be making record highs. Let’s review the general economic background. According to the Bureau of Economic Analysis, US GDP increased 5.6% in the first quarter, 2.6% in the second quarter and 2.2% in the third quarter. The BEA revised third quarter GDP up from 1.8% to 2.2%. However, the three quarter trend is clear: growth is slowing. Nonfarm payroll employment rose by 132,000 in November, and the unemployment rate was essentially unchanged at 4.5 percent, the Bureau of Labor Statistics of the U.S. Department of Labor reported today. Job gains continued in several service-providing industries, including professional and business services, food services, and health care. Employment declined in construction and manufacturing. Hourly wages have actually increased through November of this year. So far, hourly wages increased from $16.40 in January to $16.91 in November for an increase of 3.1%. Over the same period, the inflation index increased from 198.3 to 201.5 for an increase of 1.61% making wage gains 1.49%. However, this is the first year of this expansion when wages have increased faster than inflation. So this is good news, but it will take a bit of time for 80% of the population to start making money beyond inflation. However that may prove difficult in a 2.2% GDP growth rate environment. So using the above metrics we see the US is in a low-unemployment situation with increasing wages. But growth is slowing and the housing market is slumping. In other words, it is more likely the slow growth environment will continue, especially considering a slumping housing market. So the US economy is technically in good shape, but certainly not something to write home about. Let’s turn to the markets. 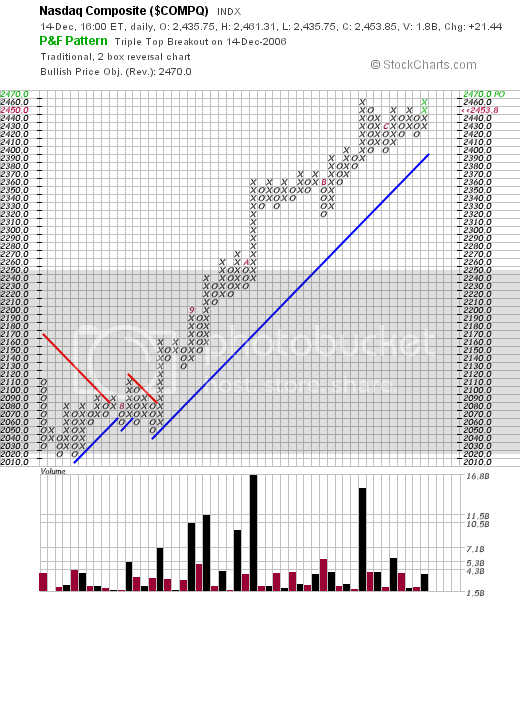 Below are point and figure charts for the Dow Jones Industrial, S&P 500 and NASDAQ. These charts are designed to show major price movements, essentially filtering out the statistical noise from day-to-day price fluctuations. The numbers and letters you see on the chart symbolize months, with the letters A, B and C symbolizing October, November and December. 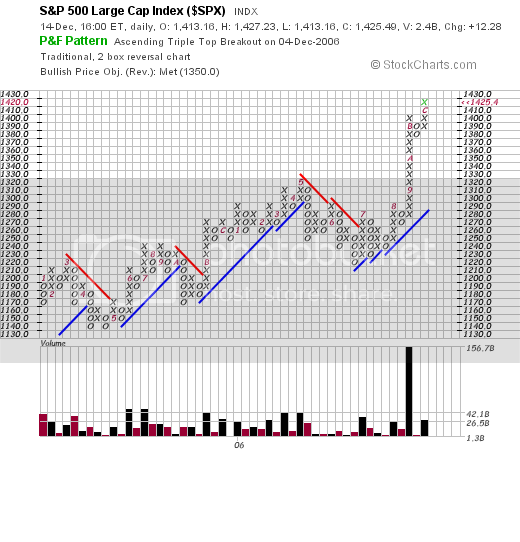 The charts are from Stockcharts, which is a really good website for technical information. 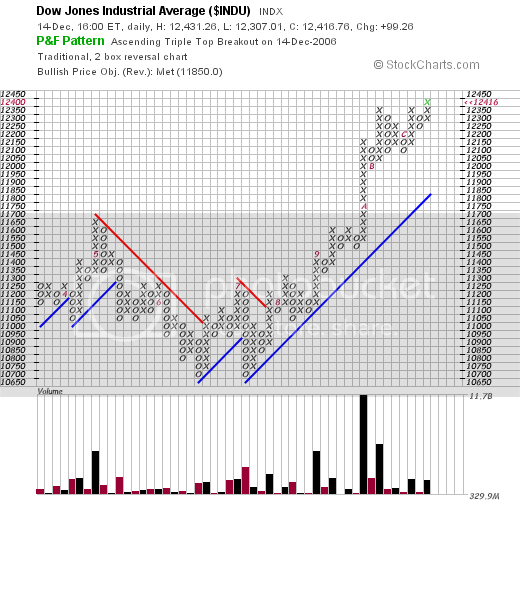 When looking at the charts below, pay particular attention to the volume bars in the lower part of the chart. With the Dow chart, notice how the total traded volume doubled in the rally from August to September. With the S and P, notice how the volume increased 1.5 times for the latest rally. And with the NASDAQ notice we have two very large volume bars for the September rally and 1 for the October rally. With each average we have a big total volume increase during the latest rally that is at the least 1.5 times as large as other rallies. The last time the markets had a strong rally was from March 2003 to early 2004. 10-week bar average volume of the SPYs was right around 216 million. In the current rally, that number is right around 366 million – 1.7 times the 2003 number. Those same numbers for the QQQQs were 414 million and 564 million. While the QQQQ recent volume increases aren’t as large as the SPYs, they are higher. This leads to a few questions. First – where is this volume coming from? For the last 4-6 months, the Federal Reserve has been using a ton of repo agreements increase money supply via M3. That would explain some of the volume. The latest TIC data indicates foreigners have increased their purchasing of equities. Through October of 2005 they had purchased 83.6 billion of securities, whereas they had purchased $114 billion through October 2006. This is a net increase of 37%. But more importantly is this observation from the great trader W.D. Gann. He divided market developments into 7 phases, one of which was The Third Zone, or the highest above normal marks. Basically, everybody is buying, everybody is talking about how wonderful the market is, the market continues to advance for a period of weeks or months and people get “too full of hope to sell.” These areas of the market are easy to identify -- after prices fall. While it’s going on it’s hard to discern exactly what is happening. So – are we in this third zone? The length of the rally and the large increase in volume compared to the 2003 rally would indicate the possibility is higher. In addition, we have a slowing economy, a troubled housing market, oil under upward pressure from OPEC production cuts and a falling dollar – all of which are bearish. On the plus side, unemployment are statistically low and hourly wages are increasing after inflation for the first time during this expansion. Technical analysis is not a science. just because the events say something will probably happen does not mean it will happen. However, right now we have a higher probability of the markets nearing a top. Did Retail Sales Really Increase 1% in November? I have to admit -- Wednesday's retail sales number has been bugging me since it was released. Part of this is because it completely disrupts my personal thesis for the economy -- that the US economy is teetering on the edge of a recession largely due to housing. No one likes to have to actually rethink their position -- or God forbid admit they were wrong. (Please read that with a dose of extreme sarcasm). So, let's go back to a couple of categories in the retail sames number to see what the internals say and compare those number to some other readily available retail sales numbers. Let's start with the Bank of Tokyo Mitsubihi's Chain Store Sales Report. According to this survey, the seasonally adjusted month-to-month percent change in same store sales was -1%. October's number was slightly better at a -.6% drop. The year-over-year percent change in the number was 2.1%, which was the lowest reading of 2006 except for March when the number was 2%. We run into a problem with the Census data at this point because the Census states, "Data not adjusted for seasonal variations, holiday, trading-day differences, and price changes." So, read that as a disclaimer. However, most of the other retail data released is seasonally adjusted. So we have to work with what we have to figure this situation out. Continuing our look at the BTM numbers for specific categories of retailers, specialty apparel, general merchandise and drug stores all advanced, but not at greatly accelerated rates. Specialty apparel increased 2.4%, general merchandise increased 1.6% and drug stores increased 8.4%. None of these numbers were radically higher than any previous months. In fact, general merchandise sales decreased sharply in October and November. The Census data says that "Building material & garden eq. & supplies dealers" increased from (in millions) $29,289 to $29,817 The BTM survey says home supply sales sales decreased 15.7%. It's also important to remember the housing market is in a slump right now. Sales are down, inventory is up. Is this a real estate market where building materials and supplies sales will increase 1.8%? 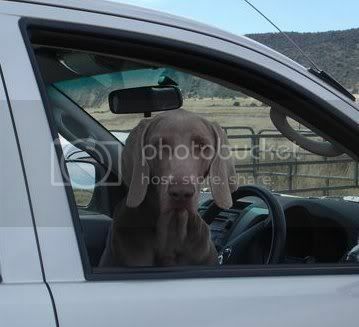 According to the census data, car sales increased from (in millions) $77,197 to $77,906. This data is not seasonally adjusted. However, according to motor intelligence, the seasonally adjusted annual rate of US car sales decreased from 16.16 million in October to 16.04 million in November. This is the lowest seasonally adjusted annual rate for car sales this year. In November WalMart reported their November sales decreased .1%, the first drop since April 1996. Other retailers showed increases. However, Wal-Mart is far bigger than their competitors. Ever since the Fed stopped raising interest rates, they have included a statement in the FOMC statement to the effect that a slowing economy will lower inflation. However, inflation pressures seem likely to moderate over time, reflecting reduced impetus from energy prices, contained inflation expectations, and the cumulative effects of monetary policy actions and other factors restraining aggregate demand. The inflation numbers have born out this possibility. The Consumer Price Index for All Urban Consumers (CPI-U) decreased 0.1 percent in November, before seasonal adjustment, the Bureau of Labor Statistics of the U.S. Department of Labor reported today. The November level of 201.5 (1982-84=100) was 2.0 percent higher than in November 2005. The all items number decreased .5% in September and October, right when the Fed started using the above referenced statement. I will admit I was incredibly skeptical of Bernanke's statements and predictions. However the record thus far is undeniable. Does Today's Rally Make Sense? U.S. stocks resumed their fourth- quarter rally, pushing the Dow Jones Industrial Average to a record, after companies reported profits that beat analysts' estimates and the number of claims for jobless benefits fell. Advanced Micro Devices Inc., the world's second-biggest maker of computer processors, had its steepest gain in two years after raising its earnings forecast. Bear Stearns Cos. climbed to an all-time high after the investment bank reported record net income. Costco Wholesale Corp., the largest U.S. warehouse club, led retailers higher on results that beat forecasts. The rise in profits shows that companies are withstanding a slowdown in manufacturing and housing. The drop in jobless claims, along with data this week showing a rebound in retail sales, signaled consumer spending will keep driving growth. ``Corporate earnings are continuing to be strong,'' said Patrick Becker, who helps manage $2.3 billion as chief investment officer at Becker Capital Management in Portland, Oregon. ``The slowdown isn't here in any major way. That's part of the reason we're seeing moves up." Bear Stearns and Lehman Brothers reported record earnings. Earlier this week, Goldman Sacks reported good earnings. Yesterday we had a strong retail sales report -- although some economists are questioning the strength reported. But, against that backdrop we have GDP decelerating to a revised 2.2% in the 3rd Q. We have a housing market in serious trouble. Employment growth is good, but not great. Earnings are up, but largely because energy inflation is down. In addition, OPEC reported they will again cut production on February 1. This could increase energy inflation, again cutting into earnings. Is this the environment for a record Dow? Clearly, the market is buying the soft-landing scenario. 1.) The agreement gives OPEC some wiggle-room. The cut is not immediate, but will occur in February. If the market changes radically they may consider changing their decision. 2.) I would guess this would put a floor on oil at roughly $60/bbl (more or less). That could have inflationary implications for the US. 3.) I haven't seen anything about how the last OPEC cut is being implemented. So, I don't know if it was all talk or whether there was any action as well. In the week ending Dec. 9, the advance figure for seasonally adjusted initial claims was 304,000, a decrease of 20,000 from the previous week's unrevised figure of 324,000. The 4-week moving average was 327,250, a decrease of 1,500 from the previous week's unrevised average of 328,750. 13 states had 1000 or more lay-offs in construction. This is the second week in the last month with a lot of construction lay-offs. Winter construction lay-offs are standard practice. The question is, "will there people get rehired"? The graph indicates construction employment has topped and will now go into a decline, especially as the housing market continues to cool. Given the present set of economic variables, it's more likely this months lay-offs won't be rehired in the spring. Import prices rose 0.2 percent in November following the petroleum driven declines of 2.3 percent and 2.2 percent in October and September, respectively. The index for overall imports increased 1.2 percent over the past 12 months. Petroleum prices fell a more modest 1.6 percent in November compared to the double-digit declines recorded in the prior two months. Despite the recent downturn, petroleum prices advanced 1.5 percent for the year ended in November. Nonpetroleum prices resumed an upward trend in November, following a 0.5 percent decline in October, rising 0.7 percent for the month and 1.3 percent over the past year. Oil is obviously the most variable part of this number. Oil decreased 10.9% in September, 10.1% in October and 1.6% last month. This decrease is the primary reason for the decrease in import prices over the last few months. Oil is the central problem with oil prices. I've said it before, and frankly I'll keep saying it probably for the rest of my life. So long as the US is a major oil importer, we are one geo-political crisis away from major problems. The .2% increase should help to calm any fears of a Fed raising. However, the .7% rise ex-oil may lead to a different conclusion. However, total imports are about 13% of the US economy. In other words, this is a number to keep you eyes on, but don't overstate its importance. Import prices rose 0.2 percent after falling more than 2 percent in each of the two prior months, the Labor Department said today in Washington. Excluding petroleum, the index rose 0.7 percent following a 0.5 percent decline the prior month. Prices of natural gas, which is in the non-petroleum category, soared 30.3 percent, the biggest increase since November 2004. A weaker dollar also boosted the tab on imports. The Federal Reserve this week kept its benchmark rate unchanged for a fourth consecutive policy meeting and said ``inflation risks'' remained. ``The recent sharp drop in the dollar suggests some upside risk to trade prices through year-end and into early 2007,'' Mike Englund, chief economist at Action Economics LLC in Boulder, Colorado, said before the report. Equities ended the day largely unchanged as the blue chip Dow Jones Industrial Average closed 1.92 points higher and the tech heavy NASDAQ rose less than a point. Stocks were given a boost in early morning trading by a strong November retail sales report and a wave of speculation about mergers in the airline industry which sent the stocks of a number of airlines including Continental (CAL: Charts, News, Offers) and AirTran (AAI: Charts, News, Offers) up. However, stocks failed to build on that early momentum on a day when trading volume on the NYSE was pretty light. A report which showed that crude oil inventories fell greater than expected also unnerved traders a little bit. Bond prices fell while the dollar gained on both the euro and the yen. The markets barely made any headway today. But the start was strong. The futures were up on strong pre session economic news, and the market opened higher, but that was about it. They sold off sharply in the morning, held secondary support, and then bounced back and forth in a coiling-type pattern. In the last hour they attempted a rally and did break out, but there was very little follow-through and they backed and filled into the close. Merger talk in the airline sector gave stocks an early boost Wednesday, but the major averages pulled back amid rising oil prices and a selloff in the chip sector to finish the session little changed. After touching a new intraday high of 12,368.61, the Dow Jones Industrial Average reversed ground and closed with a gain of 1.92 points, or 0.02%, to 12,317.50. The Dow received limited support from gains of 1.3% or more in components McDonald's (MCD - news - Cramer's Take - Rating), American Express (AXP - news - Cramer's Take - Rating) and Exxon Mobil (XOM - news - Cramer's Take - Rating). Notice the phrase, "after touching an intra-day high". Traders like to see markets advance through highs and close above them. That indicates traders are confident prices will move higher. When prices don't close above new highs, it indicates hesitation and concern; traders don't want to carry those new positions overnight for fear that news will create selling pressure in the morning. Also, considering the strength of today's retail sales report, volume could have been stronger. That marked a sharp rise from the second quarter's delinquency rate of 4.39 percent and was the worst showing since the final quarter of last year, when delinquent payments climbed to a 2 1/2-year high in the aftermath of the devastating Gulf Coast hurricanes. Delinquency rates in the third quarter were considerably higher for "subprime" borrowers -- people with weaker credit records who are considered higher risks -- especially those who have adjustable-rate mortgages. Subprime borrowers had a delinquency rate of 12.56 percent in the third quarter, the highest in more than three years. The delinquency rate for these borrowers holding adjustable-rate mortgages was even higher -- at 13.22 percent in the third quarter, also the worst reading in more than three years. Those are some high numbers. What's really important to remember is next year between $700 billion and $1 trillion (depending on which news source you base the estimate on) of ARMS will reset -- most a higher rate. That means going into next year the subprime market could experience some really ugly developments. The U.S. Census Bureau announced today that advance estimates of U.S. retail and food services sales for November, adjusted for seasonal variation and holiday and trading-day differences, but not for price changes, were $368.9 billion, an increase of 1.0 percent (±0.8%) from the previous month and up 5.6 percent (±0.7%) from November 2005. Total sales for the September through November 2006 period were up 5.3 percent (±0.5%) from the same period a year ago. The September to October 2006 percent change was revised from -0.4 percent (± 0.7%)* to -0.1 percent (± 0.2%)*. Retail trade sales were up 1.1 percent (±0.8%) from October and were 5.3 percent (±0.8%) above last year. Nonstore retailers were up 10.1 percent (±4.5%) from November 2005 and sales of health and personal care stores were up 8.7 percent (±1.7%) from last year. Let's dig a bit more into the numbers. The biggest jump came from Electronics and Appliance Stores, which saw an increase of 4.6%. This is important because Prudential Securities downgraded Circuit City and Best Buy today. We also saw a 2.3% increase in gasoline sales. The recent uptick in gas prices helped out here. There was also a .9% increase in auto sales and parts. My guess is we are continuing to see a switch to more fuel efficient autos. I previously noted that a decrease in energy related inflation was a primary reason for the wage gains. But as noted above, retail fuel prices are increasing. Obviously they haven't increased enough to debt consumer spending, but it's something to keep an eye on. This post could be seen as following up on a number of good posts connected to the state of play with the most recent current accounts numbers and events in US$ foreign exchange markets. However, that would be an illusion ... indeed, as you can see above, "2006" is not even in view here. The focus here is on the long term. So it is both very bad, and getting worse at a rapid rate. And there is far more that I want to say on this than fits the print ... so the main post is now sitting down in the Saturday archives, which means that you can reach it by clicking here to get under the fold. Treasury Secretary Henry Paulson needs a new appointment scheduler. Someone on his staff failed to notice that as the former Goldman Sachs honcho heads to China this week, the U.S. Trade Representative was slated to released the 2006 Report to Congress on China's WTO Compliance. The report, issued today, is highly critical of the Chinese government's failure to meet their obligations. It places a “particular emphasis on reducing IPR [intellectual property rights] infringement levels in China” and on pressing China to make greater efforts to institutionalize market mechanisms and make its trade regime more predictable and transparent. The timing couldn’t be worse for Paulson. When Bush and the Republican Congress rammed through China’s membership in 2001, they assured us that making China a full partner would ease the path for that nation to lower its trade barriers and bring its laws and regulations into compliance with international standards. In fact, the opposite occurred: Since China joined the World Trade Organization (WTO) in 2001, the U.S. deficit has grown to more than $200 billion. In 2005, the trade deficit with China grew by 25 percent to $202 billion—the largest bilateral deficit in world history. Behind this unsustainable trade deficit are two major factors: China’s policy to devalue its currency and its abysmal workers’ rights record. In fact, the Treasury Department once again is delaying the release of its semi-annual report on currency—so as not to embarrass Paulson while in China. Although the undervaluation of China's currency has become accepted fact, every Treasury report to date has failed to suggest taking any action. While Paulson will chat with China’s leaders about the China’s currency devaluation, he has no intention of bringing up workers’ rights. He should—if not because ethical principles call for providing fellow humans with decent working conditions and living wages, then for our own self-interest as a nation. Because addressing China’s human rights violations is one important step toward reversing the declining U.S. trade balance with China. The deterioration of working conditions in China continues every year, with nearly non-existent enforcement of wage, overtime, safety and health and environmental laws. Oppressing Chinese workers is the functional equivalent of devaluing currency. In failing to address the systematic abuse of its workers, the Chinese government further displaces U.S. jobs. American companies like Wal-Mart rack up billions of dollars in profits by taking advantage of the artificially low wages made possible by the Chinese government’s repression of democracy, political dissent and fundamental human and workers’ rights. Application of an International Trade Commission model shows that up to 973,000 manufacturing jobs and 1,235,000 total jobs are displaced by China's repression of labor rights. The nonprofit Economic Policy Institute (EPI) estimates 410,000 manufacturing jobs were lost to China between 2002 and 2004. U.S.-China Economic and Security Review Commission studies conclude that between 70,000 and 100,000 jobs are moved annually to China, and those numbers accelerated after 2001. The 2006 annual report of the U.S.-China Economic and Security Review Commission (a bipartisan, congressionally appointed commission) also provides evidence that China has been seriously inconsistent in meeting its obligations as a member of the WTO. 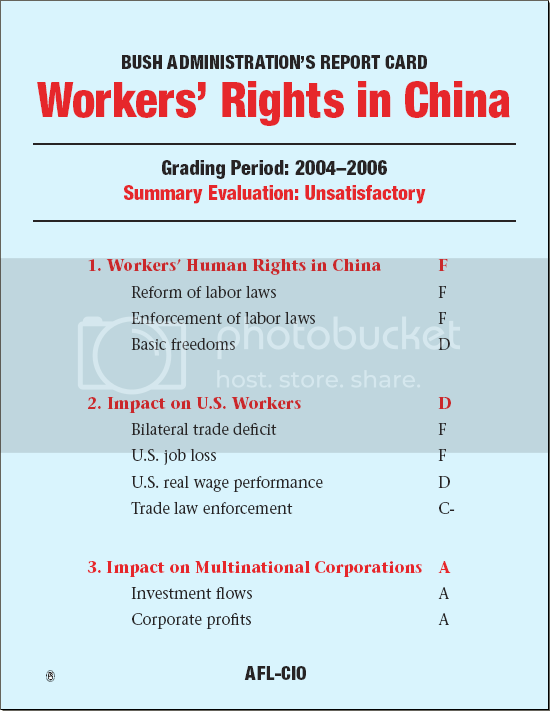 The report backs up conclusions in the AFL-CIO’s Bush administration report card on China and an AFL-CIO Solidarity Center study on workers’ rights in China. In July, the AFL-CIO filed the second workers’ rights case against the Chinese government. The Bush administration rejected the petition, despite the lack of improvement for Chinese workers since we filed the first petition in 2004. As we filed the petition this year, workers from across the nation sent nearly 70,000 letters to President Bush and Congress urging them to take action to halt the abuse of China’s workers. Chinese mines are the most dangerous in the world, with more than 10,000 Chinese miners dying in industrial accidents each year (some 80 percent of the worldwide total). Rates of illness and injury have never been higher in China’s manufacturing sector as officials of China’s own Work Safety Administration conceded as recently as February 2006. There are as many as 10 to 20 million child workers in China—from one-eighth to one-quarter the number of factory workers. The Chinese government implements an extensive system of forced labor camps. The precise number of forced prison laborers is unknown, but estimates range from 1.75 million to 6 million and higher. The right to strike was removed from China's Constitution in 1982 because the political system had "eradicated problems between the proletariat and enterprise owners." But as aggregate unpaid wages have risen to record levels, along with increased child labor, Chinese workers are walking off the job in massive numbers, despite the illegality of their actions and the risks involved. According to figures from China’s Ministry of Public Security, there was a sharp rise in officially registered public disturbances in 2005. Large-scale incidents of "mass gatherings to disturb social order" rose by 13 percent. In one report, "mass protests" or "mass incidents," including riots, demonstrations and collective petitions, rose from 58,000 in 2003 to 87,000 in 2004. These abuses allow producers in China, including many multinational and U.S. corporations, to operate in an environment free of independent unions, to pay illegally low wages and to profit from the widespread violation of workers’ basic human rights. The second factor behind China’s trade advantage, the nation’s deliberate undervaluing of its currency, the yuan, enables the Chinese government to export products at an artificially low price—running up the U.S. trade deficit and costing good American jobs. In fact, the yuan is estimated to be undervalued by as much as 40 percent. An AFL-CIO report shows China’s fixed currency rate artificially lowers the price of its goods by 40 percent and subsidizes exports, putting U.S. companies and workers at a disadvantage. The lack of currency flexibility has been a major factor in U.S. job losses and a trade deficit with China that hit $202 billion last year. Currency manipulation is one of the primary reasons for the massive bilateral trade imbalance between the United States and China, as well as for the flood of investments by U.S and other multinational companies. On top of the Chinese government’s record capital investments in manufacturing, foreign direct investment (FDI) in the country increased from $46.8 billion in 2000 to $60.3 billion in 2005. Seventy percent of China’s FDI is in manufacturing, with heavy concentration in export-oriented companies and advanced technology sectors. The dangers of this model of development are apparent: job and technical capacity loss in the U.S., growing inequality and political and financial instability in China, and the accumulation of nearly $1 trillion in U.S. dollar assets by the Chinese government. This is also a development model based upon the brutal repression of workers’ rights and human rights. Last year, the Senate introduced legislation sponsored by Sens. Charles Schumer (D-N.Y.) and Lindsey Graham (R-S.C.) that would have imposed a 27.5 percent tariff on all Chinese imports if that country did not raise the value of its currency within 12 months. The bill was never introduced in the House, and Senate leaders chose not to bring it up in the last session. Paulson fears the next Congress will pass a tariff, and this is his last-gasp trip to convince China to voluntarily devalue its currency. But unlike the 109th, the new Congress not only is more likely to take a firmer line on China’s currency devaluation, it will insist that the administration include workers’ rights as a key part of trade agreements and bilateral negotiations. And the AFL-CIO will be working with Congress to ensure that going forward, trade deals aren’t just free but fair. Here is a link to the Fed's statement. Here are a few notes to mention before we get into parsing. The FOMC is not paid to issue panic warnings or be the world's greatest cheerleader for the economy. They are paid to be economic geeks. As such, they are paid to sound like economic geeks. Don't expect to hear statements like, "this is the best economy since this country started!" Expect to hear,, "The US economy is operating at maximum capacity with minimum inflationary pressures." That's about as close to cheerleading as you're going to get. Also remember the FOMC statement is the investor's "play at home" version of Fed policy. The statement tells us what the Fed is looking at and what they are looking for. This allows greater transparency for the markets. This way when an economic number comes out that the Fed said it is looking at, we get to play along at home and make all sorts of conjectures about what the numbers actually means. They left rates unchanged. This is not a big surprise. Here's the rest of the statement. OK -- what does this mean in English? 1.) Housing is on the Fed's radar screen. So, for the next few months we'll watch the housing market. In addition, the Fed is pointing out that housing is the primary factor for the economy's recent cooling. So, in the next few months, we'll look to see if housing's influence is spreading into the economy in other areas like consumer spending, consumer sentiment and housing related employment. 2.) The Fed is still concerned about inflationary pressures, although they think a slowing economy will do the Fed's job of slowing inflation. However, this statement gives the Fed some wiggle room if they judge they need to raise rates. In other words, nothing has really changed in Fed land. "...gradual cooling of the housing market." "...cooling of the housing market." "...substantial cooling of the housing market." Now there's a really subtle shift of phrase to catch. From the Mahablog. A discussion on the public versus private debate between Democrats and Republicans. You know that for years, one of the cornerstones of rightie civic religion is that private is always better than public. The rightie answer to all government problems has been (after cutting taxes) to first deregulate, then privatize. Righties have a pure and abiding faith that public bureaucracies are wasteful and stupid and corrupt, while private companies are efficient and competent and always do the job better, whatever that job is. Last week the New York Times published a series of articles on the salvage effort that rebuilt the Pacific Fleet after the Japanese attack at Pearl Harbor. These serve as a reminder of what government — transparent government, accountable government — can accomplish. Compare the work at Pearl Harbor one year after the attacks, as reported at the time by Robert Trumbell, to New Orleans today. And weep. It's a very interesting article, especially as we start to grapple with "what should the government do, and how should it do that job." The U.S. trade deficit narrowed more than expected in October as the price of imported oil dropped and faster growth abroad boosted exports to a record. The gap fell 8.4 percent, the biggest decrease in almost 5 years, to $58.9 billion, the Commerce Department said today in Washington. The improvement came despite a record deficit with China, which surpassed Mexico as the nation's second-biggest trading partner. A weaker dollar and growing demand from Europe and Asia may spur exports and limit weakness in manufacturing, which would help prevent the economy from sinking as housing slumps. Federal Reserve policy makers today will probably keep their interest- rate target steady as they count on more moderate growth to eventually bring down inflation. The chart indicates we have a serious long-term deterioration happening. One month won't change that. We're already $54,884 billion ahead of last year's January to October period. We're also only $73,290 billion behind last years total trade deficit. So we're still on target to set another record this year. Imports increased 12% from 2004 -2005 while exports increased 10%. So far, exports for the January - October period have increased 13% while imports have increased 11.71%. So from a statistical perspective, exports will have to make a big jump to make a serous dent in the trade deficit. Of course, the mechanism underlying this model may imply that it could take a while for the U.S. trade deficit to adjust in response to persistently higher oil prices, as businesses need time to install new, less energy-intensive equipment. However, one positive and important implication is that eventually the U.S. economy will become more energy-efficient, which, in turn, would help contain the cost of oil imports and increase the economy's flexibility in absorbing future oil price increases. While oil prices have dropped over the last few months, they are in a trading range between $60 -$64 a barrel. OPEC has announced one production cut and another one is rumored to be in the works. While the slowing US economy is a net negative for oil prices, China and India are growing at very fast rates putting upward pressure on oil. European and Japanese growth rates are increasing. In other words, there is a lot of macro-level support for oil prices at their current level. 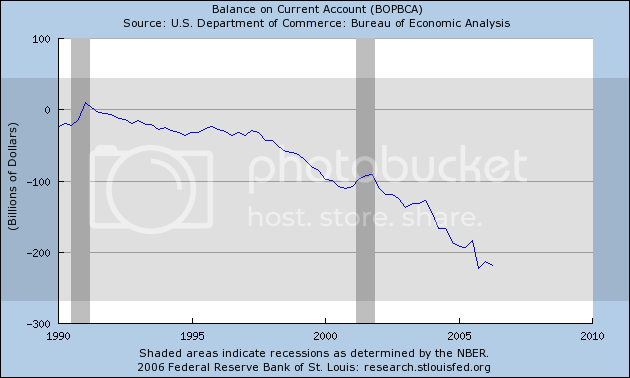 So while the trade deficit's one month decrease is good news, there are still important structural reasons for the deficit to remain high for some time. The dollar fell the most in a week against the euro after former Federal Reserve Chairman Alan Greenspan said the U.S. currency will probably keep dropping until the nation's current-account deficit shrinks. The U.S. currency has lost 10.5 percent this year versus the euro as investors bet the European Central Bank would lift interest rates more than the Fed. The dollar fell three of the past four years. It's imprudent to hold everything in one currency, Greenspan also said. He spoke via satellite to a conference in Tel Aviv. The dollar reversed course on Monday and fell against the euro after former Federal Reserve chief Alan Greenspan said he expected U.S. currency weakness to last "a few years." The dollar was already under pressure as traders took profits on Friday's post-payrolls rally, but Greenspan's remarks via video conference to a business meeting in Tel Aviv helped the euro break a three-day losing streak. "What we're hearing from Greenspan is reinforcing the view that the dollar has further room to fall. We got positive news on Friday, but it's certainly not enough to reverse the trend," said Greg Salvaggio, vice president of trading for Tempus Consulting in Washington D.C., referring to U.S. November jobs data. The total amount has nearly doubled in about 4 years. Stirling Newberry states the situation this was: "The US is renting money from the Chinese". This is basically how the US is financing its standard of living right now. 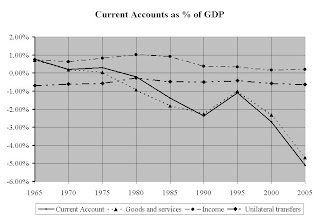 There have been several theories advanced that tried to minimize the trade deficit reality. None of these theories stands up to strict scrutiny. The problem is this may limit the Federal Reserve's ability to lower rates in the coming year if the US economy continues to slowdown or goes into a recession. In other words, trade deficits matter. What's Up With the Oil Market? Above is a weekly chart for oil. It shows that oil peaked around $80/bbl in August and has been coming down in price since then. At the beginning of October oil went into a trading range between roughly $60 and $64. Anytime you see any security, commodity, future, whatever in a trading range, it indicates supply and demand are near equal. Traders think these prices are more or less fair for oil. Nothing has happened that would alter that fundamental perception. What makes this interesting is OPEC announced production cuts this fall. There have been several news stories that OPEC is considering another production cut as well. However, this news hasn’t been enough to move oil higher. There are two reasons for this. First, OPEC is notoriously undisciplined – member states have routinely broken previous production quotas. Secondly, the US economy is slowing indicating US demand for oil may decrease. Therefore, prices of $80/bbl are unwarranted given the current US economic situation. Starting at the beginning of November, you see oil form a reverse head and shoulders formation. This could indicate the end of the trading pattern for oil. However, as with all technical analysis, it’s important to look at the fundamental situation to see if that makes sense (we’ll get to that in a minute). Now, let’s go to a longer chart, this one with weekly bars. There are two ways to look at this chart. The first is as a decline starting just after July, with a reaction move (or an upward rally) starting four bars from the right. Or, you can look at the formation starting in October as a rounding bottom of the downtrend that started in late July. Either interpretation indicates something new is probably about to happen. The first major cold front of winter crossed much of the country last week, beginning with snow in Seattle during Monday Night Football, continuing with several inches of snow in parts of the Midwest by Thursday, and followed by cold, windy weather along the East Coast this past weekend and the first part of this week. In much of the country, anyone walking their dog at night, recently, understands that winter has arrived. And, as predicted, higher oil prices have arrived with the colder weather. Colder weather is a net positive for the market, as it means winter fuel needs will increase. In addition, distillate stockpiles are decreasing, lowering overall supply. A roughly 10% chance of oil dropping below $60. The market has had plenty of reasons to drop the price further – OPEC, a slowing US economy and consistent US stockpiles – and hasn’t. Clearly, $60/bbl provides strong support for the current background. It will probably take a change in the overall economic picture to lower prices below $60/bbl. Chance of remaining in the current range – 45%. The market has also had good reason to drive the price up – again the OPEC production cut and the current cold front --- but hasn’t. Clearly, traders like the current range. Chance of breaking trend – 45%. There are myriad reasons for a break above the current levels. Weather is one. Traders looking at the chart and seeing the upside down head and shoulders formation and buying on that is another. Here is the one thing to take away from this: technical analysis is not an exact science. You can get a feel for the general direction of the market. But, the market will always do its very best to humble you at every turn. The trade deficit and the FOMC announcement are on Tuesday. Expect the usual massive amount of parsing regarding the Fed's statement. Retail Sales and business inventories come out on Wednesday. Retail sales have dropped for the last two months. Also Wal-Mart announced it's same store November sales actually decreased last month for the first time in a, well, long time. So this is a pretty important number. But I would caution, Christmas shopping has become a notoriously late in the season affair, especially with the increasing use of gift cards that are used in January. Import/Export prices and weekly jobless claims are on Thursday. The 4-week jobless claims number has been moving up for the last few weeks, so we should keep an eye on that number. Finally we have CPI, Empire State Index (NY manufacturing) and Industrial production on Friday. 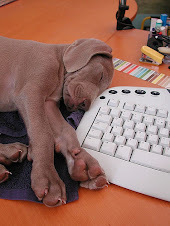 This is also the last really full week of work and trading before Christmas starts in earnest. I would expect Friday the 22 to be very light, and Thursday maybe so as well. So this week's numbers could take on a disproportionate importance for traders. For anyone who wants to play along at home, go to the NBER link on the right hand side and click on economic numbers and statistics. Tuesday, Ownit Mortgage Solutions of California shut down, citing "the unfavorable conditions of the mortgage industry." That's a euphemism for subprime home borrowers getting into trouble and defaulting on loans at unprecedented speed. Ownit would sell loans it originated to Wall Street, which repackaged them as mortgage-backed securities. 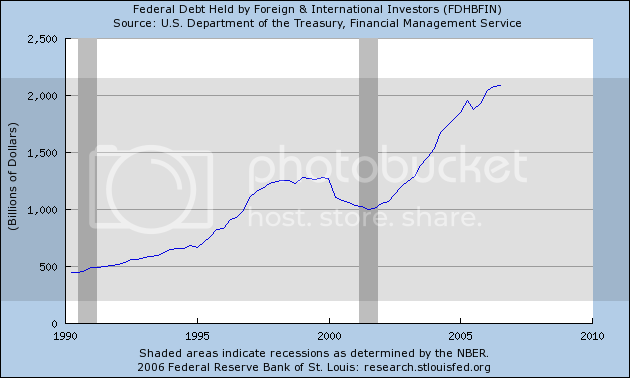 But, as Dow Jones Newswires reports, the issuers of the MBS can force Ownit to take back loans that go into default. Ownit ran out of cash to repurchase the bad loans for the street, according to industry sources quoted by Dow Jones Newswires. Here’s a brief overview of the mortgage market. When you get a home loan from a bank, the bank doesn’t keep the loan on its books. Instead, it sells the loan to a larger institution. These mortgages usually end up with Fannie Mae or Freddie Mac. Freddie and Fannie take similar mortgages (mortgages that have the same interest rate, maturity etc…) and “pool them”, or puts them together in one giant mortgage bond. Then, these institutions sell the mortgages to pension funds, mutual funds and other investment companies. When people state that Fannie and Freddie have added liquidity to the mortgage market, the above-mentioned process is what they are talking about. In 2003, Dallas and a group of investors including Chicago- based CIVC Partners bought Ownit. They expanded the company's annual mortgage issuance at least eight-fold to more than $8 billion last year. Nonprime News, an industry newsletter, ranked Ownit as the 11th-largest U.S. issuer of so-called subprime mortgages, or home loans made to borrowers with low incomes, untested credit or a track record of default or delinquency. The company issued $5.46 billion of loans during the first half of the year, 44 percent more than a year earlier, according to the newsletter. What’s important about this particular story is Ownit was a large company. They weren’t a fly-by-night organization; they were almost in the top ten of all US sub-prime mortgage lenders. That should indicate the sub-prime mortgage market is definitely showing signs of problems. The mortgage bond market is beginning to buckle under the weight of the worst U.S. housing slump in six years. Yields on so-called sub-prime mortgage securities rated BBB have risen to 6.52 percent on average from 6.28 percent on Sept. 5, data compiled by Bank of America Corp. show. The yield premium, or spread above the one-month London interbank offered rate, a lending benchmark, rose to a seven-month high of 1.2 percentage points. About 3.3 percent of the $160 billion in sub-prime loans made this year through July have payments that are more than two months late, the highest ever for mortgages in their first year, according to New York-based Fitch Ratings. Housing starts tumbled in October to an annual rate of 1.486 million, the lowest in more than six years. The economy grew at the slowest pace since 2005 during the third quarter. The primary benefit of pooling mortgages as mentioned above is to diversify risk. If 1 mortgage among 100 goes bad, the pool is still in fine financial shape. However, the larger percentage that goes bad, the worse off it is for investors. The fact that mortgages are starting off with a high rate of defaults does not bode well for the future; it indicates that worse problems are probably further down the road. Grant's Interest Rate Observer has been among the first to pick up the warning signs of the trouble in the subprime mortgage market. The current issue, dated Dec. 1, points out that loans made in 2006 already are turning bad. In past cycles, it generally took a few years for borrowers to go bust. Grant’s Interest Rate Observer is a must-read in the bond industry. The point is market watchers are picking-up on the early problems of the latest sub-prime market. The deteriorating conditions for subprime mortgages also have been evident in the relatively opaque market for credit derivatives. The benchmark for these loans is an index known as ABX, which are split into the various sub-indices of varying quality. According to Markit, an online source of valuation for derivatives, the lowest-quality indices, the ABX.HE 06-1 BBB and BBB-minus, recently suffered a "credit event." Two underlying bonds had interest shortfalls resulting in losses, according to a Nov. 27 release from Markit. This week, the ABX has taken "a pounding," according to one mortgage professional, especially in the triple-B-minus indexes. Investors have been trying to get protection by selling this lowest tier of the ABX index. But, according to this pro, the value of the constituent credits in the index may be even lower than implied by the index's value -- because there's no market for credit protection for the individual names. So still more selling may be ahead. Credit derivatives are a relatively new development in the mortgage market. 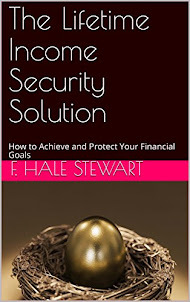 Essentially, they are an insurance policy of sorts on mortgages. Remember those pools mentioned above? A person who holds one of those mortgage pools can buy a credit derivative as something like an insurance policy in case a mortgage in the pool goes bad. The fact that derivatives are increasing in price simply means the perceived risk is increasing. That’s not a good sign. So – the 11th largest sub-prime lender goes bankrupt, recent sub-prime delinquencies are increasing at higher than expected rates and credit derivative prices are increasing. Adding these up and we get a pretty ugly picture for 2007.